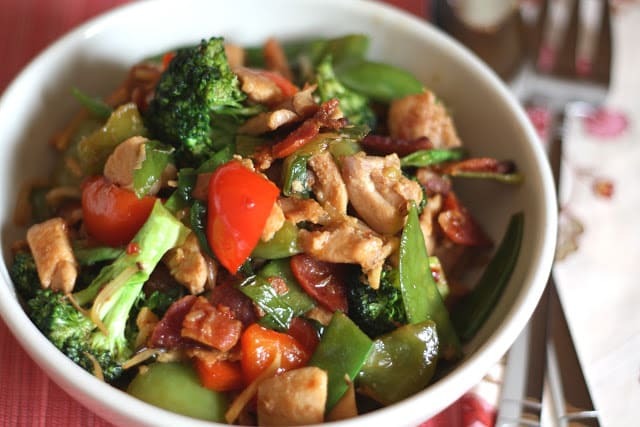 Broccoli, red and green peppers, snow peas, bean sprouts and green onions are quickly stir-fried with chicken and bacon; leaving everything hot and crisp and coated in a perfectly sweet and spicy sauce. 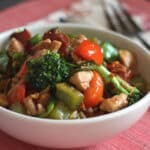 Ever since I added bacon to a stir fry for the first time last year, I have had a hard time resisting adding it almost every time now! Just a little bit of bacon adds a huge amount of flavor to this meal. The unexpected salty bites are irresistible. Once the veggies are prepped, this dish comes together in just minutes. I make a variation of this stir fry at least once a month and there are seldom any leftovers. We love this so much. If you’re cooking more than a pound of meat, you’ll want to split it up and cook small batches. Small batch cooking helps brown and seal the meat and keep it tender. Adding too much meat will reduce the temperature of the pan, produce more liquid, and cause the meat to stew instead of sear. Cooking too much meat at a time can result in tough meat that hasn’t absorbed much flavor. After the meat has cooked, add the firmer vegetables to the skillet first and then add softer vegetables as the firmer vegetables begin to soften. When the vegetables have softened, add the meat and any sauces to the pan. Stir, heat everything once more, and reduce the sauce as needed. For more great stir-fry meals, check out Sean’s favorite Steak Stir Fry, and if you have an abundance of summer squash in the house, this flavorful Southwest Chicken Skillet from The Weekday Lunches and Breakfasts Cookbook is a winner. Do you have a seafood lover in your life? Try the Salmon and Vegetables Stir Fry by Aggie’s Kitchen or Kielbasa and Shrimp Fried Rice for a meal that everyone loves. 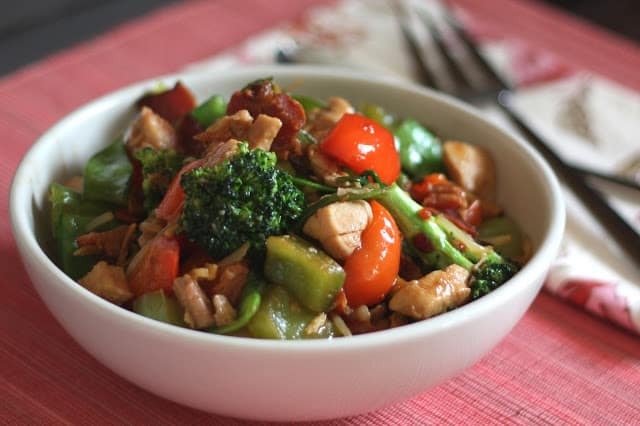 The Garlic Lover’s Vegetable Stir Fry by Kalyn’s Kitchen and the Ginger Chicken and Broccoli Stir Fry are vegetable filled favorites too. In a large bowl, whisk together the arrowroot and the egg white. Toss the chicken pieces and the ginger into this mixture and set aside. In a small cup, whisk together the soy sauce, brown sugar and chili paste. Set aside. Place the bell peppers and green onions in a small bowl, set aside. Place the broccoli, snow peas and bean sprouts in another bowl, set aside. Heat a large skillet or wok at just under high heat. Add the bacon pieces and cook, stirring frequently, until they are crisp and browned, about 5 minutes. Without draining the oil, add the chicken and ginger to the skillet. Cook, tossing constantly, until browned, about 4-5 minutes. Add the peppers and onions and stir to combine. Toss constantly while they cook until crisp tender, about 4 minutes. Add the snow peas and bean sprouts and stir to combine. Tossing constantly, cook for about 1 more minute until the colors are bright and everything is slightly softened. Add the soy sauce mixture and stir to combine. Cook about 1-2 minutes, until the sauce thickens slightly and coats the chicken and vegetables. Serve over rice if desired. Enjoy! FREEZER MEAL: Let the stir-fry mixture cool completely before transferring it to a freezer safe Ziploc bag or resealable container. Thaw completely in the refrigerator before reheating in the microwave. I'm with you on the bacon in stir frys... it truly does something amazing to them!! This one looks deliciously healthy too!!! Hey Tricia! I just realized that I never replied to your question last time. I buy nitrate free bacon when I can. Trader Joe's is a great source for that in this part of the country. However, I also buy regular bacon from Costco, because we do go through a lot of it some months! There's nothing better than stir-fry chicken. It's fast, it's easy, you can use whatever you have in it! Of course, I do mine under the broiler, because it's hard to cook up 4 pounds of chicken in a wok in any reasonable time frame! That is a lot of ginger in there and I love that! I meant to drop by earlier in the week just to say how much I loved this stir fry! It was so tasty, the bacon was a wonderful addition and it was so easy to make! You've restored my faith in Chinese-style cuisine and definitely kindled a craving from at-home takeout... Thanks so much, Mary!